A group of people gathers at their friend Janet's house to celebrate her election win. Drama ensues. Another movie about terrible, self-absorbed people yelling at each other...oh joy! 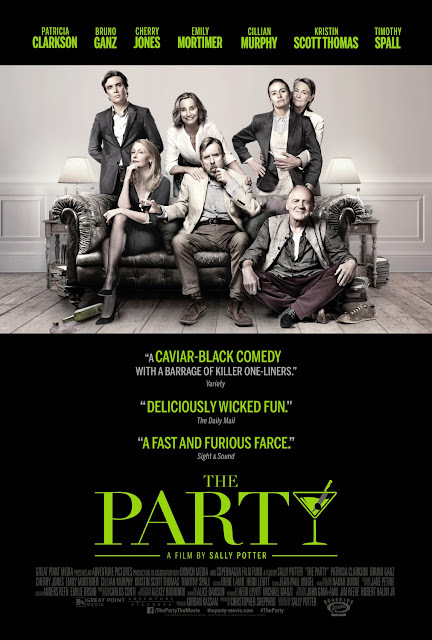 "The Party" is written and directed by Sally Potter. It is about a group of friends who come together to celebrate their host's recent political victory. Apparently, everyone in attendance has taken this invitation as a sign that they should air all of their personal grievances. What should be private drama rapidly becomes public knowledge at the party in a grandiose display. It stars Kristin Scott Thomas as the soon-to-be Minister of Health and host of the party, Janet, and Timothy Spall as her husband Bill. Also in the film are Patricia Clarkson, Bruno Ganz, Cherry Jones, Emily Mortimer, and Cillian Murphy. This is an extremely short movie and clocks in at a mere 71 minutes long. The best thing we can say about "The Party" is at least the misery of sitting through it doesn't last that long. This is a movie about a bunch of unlikable characters who come together and spew quasi-intellectual, self-important, pretentious vitriol out of their mouths for the entirety of the film for the sake of...art? Everything in this story feels impossibly melodramatic without serving any purpose or containing any message. It is clearly intended to be a dark comedy/satire, so maybe it doesn't need a purpose. Still, it's a movie about terrible people who attend the worst party in the world. Luckily, the actors do give excellent performances and offer a little nuance to an otherwise cynical, pessimistic story. The problems with "The Party" fall squarely on the shoulders of Sally Potter. Her script, her directing, and her dialogue make it feel completely unnatural. This is a film that will appeal to a very small niche of critics and moviegoers who will fawn over it because it stars their favorite actors, has no actual story (which means it's not from the typical Hollywood machine) and is shot in black and white (which means it's ~*artistic~*). Look, we don't need massive amounts of action, fart jokes, and alien invasions in every damn movie. We just don't want to watch something that makes us sink into our seats because of how irritated we are with the bleak, argumentative, sardonic film we have before us. This is the kind of film that's not good for mass consumption. There's a reason they keep movies like this away from mainstream audiences. Despite the great acting here, "The Party" is just way too unnatural, pompous, and unrealistic. It reminds us of "Who's Afraid of Virginia Woolf," but somehow a lot more jaded and combative.